Once you commit all three files to the repository (.deployment, deploy.cmd and docpad.coffee), everything is ready for Azure deployment. All of the Azure configuration will be done using the Azure preview portal. You first need to provision a new web app to host your site. If you're new to Microsoft Azure, pay attention to the service plan you're going to choose. While you're just testing everything during development, you'll want to take advantage of the free shared infrastructure tier, which allows you to host up to 10 sites for free. Once the web app is providioned for you, you can configure continuous deployment in its dashboard by clicking on the corresponding tile. Once you configure everything, Azure will scan the repository and start the deployment of the latest commit in the selected branch. If everything goes well, the build will succeed and the site will be deployed. If you try to navigate to your site, it still won't work, because DocPad generated the site in out subfolder of the working directory, while by default the root directory is being served. To change that navigate to Settings > Application settings and scroll to the bottom of the pane. Virtual applications and directories are configured there. Delete the existing root entry pointing at site\wwwroot and create a new one pointing at site\wwwroot\out. After you save the changes, the site should start working as expected. If it still doesn't work for you, you'll want to access the files on the server to diagnose the issue. There are 2 ways to do that. 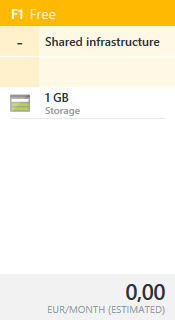 You can use Server Explorer in Visual Studio. 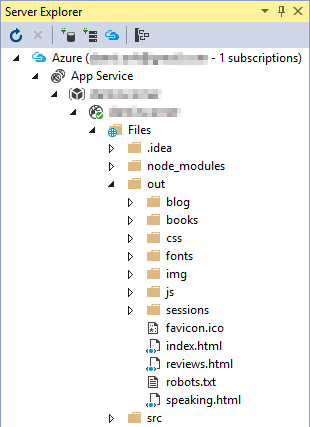 If you're connecting to Azure for the first time, you'll need to right click on the Azure node and select Connect to Microsoft Azure Subscription... from the context menu. After you enter your Azure credentials, you'll be able to navigate to your web app and directly access any of the files. Alternatively you can connect to the web app host using FTP. I don't think the password is displayed anywhere in the portal, but you can get all the connection details by downloading the publish profile from the web app dashboard. The downloaded XML file contains two publish profiles; you need the one with FTP as publishMethod. The attributes of interest are: publishUrl, userName and userPWD. Enter this information into your FTP client of choice to access the files.